The Alpine borders between Italy and France are lined with forts and high altitude military roads – most dating from the end of the 19th century or World War 1. Forte Jafferau (2805 metres) is the highest Fort in Italy and the second highest in Europe. It was built between 1896 and 1898. It was bombarded and largely destroyed as part of the peace treaty ending World War 2. 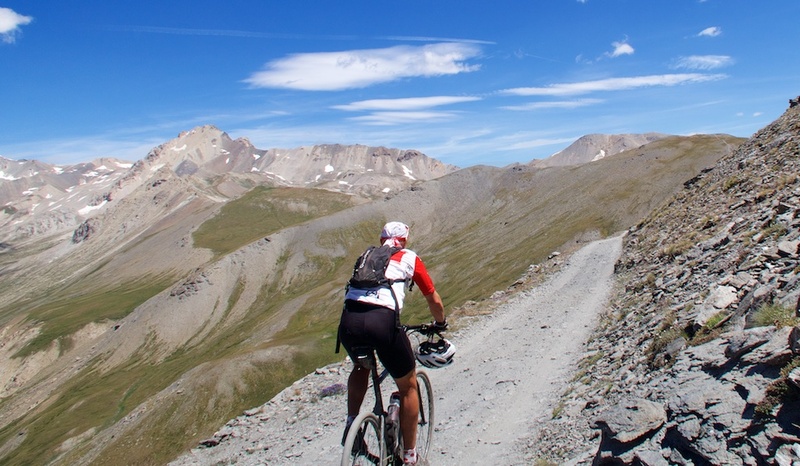 The higest Fort in the Alps is atop Mont Chaberton (3131 metres) – cycling details here. 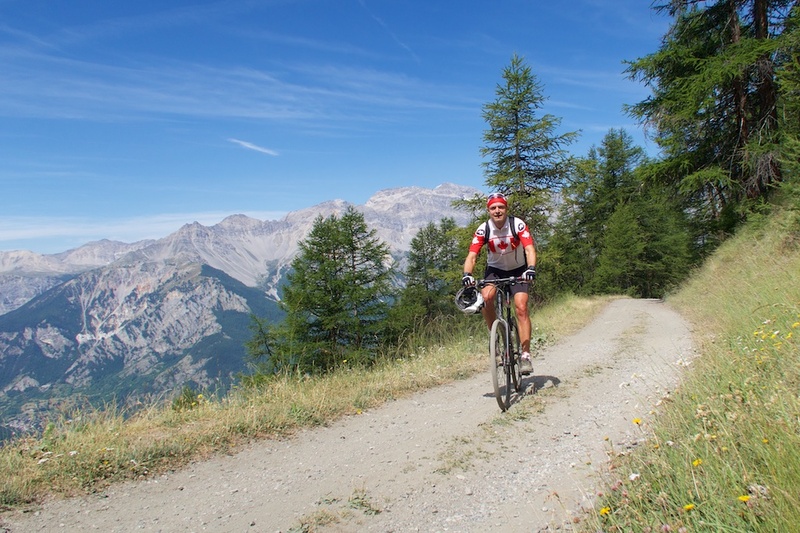 I started in Bardonecchia, climbing a paved road to the little ski station of Jafferau – it appeared in the 2013 Giro d’Italia. At roughly 1900 metres, just before the end of the paved road, I turned onto the unpaved military road: Strada militare Fenil-Pramand-Föens-Jafferau, built in 1886. 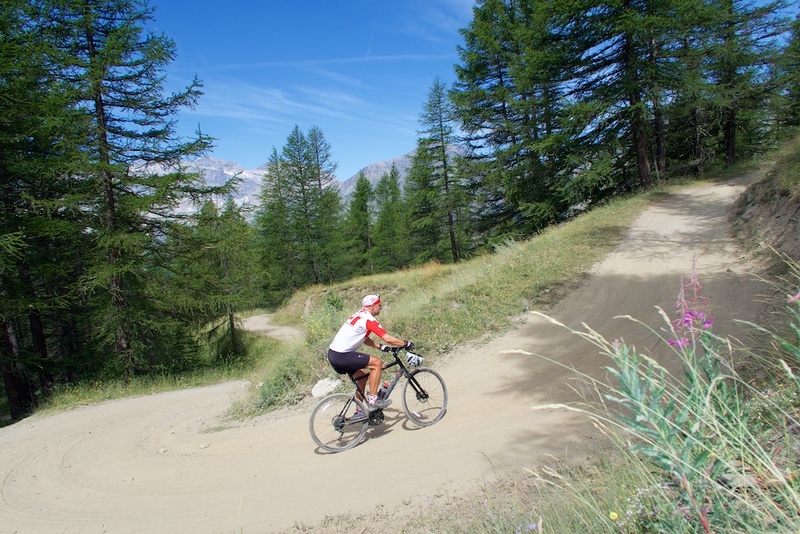 It can be slightly confusing to find the start of this ride from the centre of Bardonecchia. See map below and/or look for the road that goes under the highway signed to Gleise. 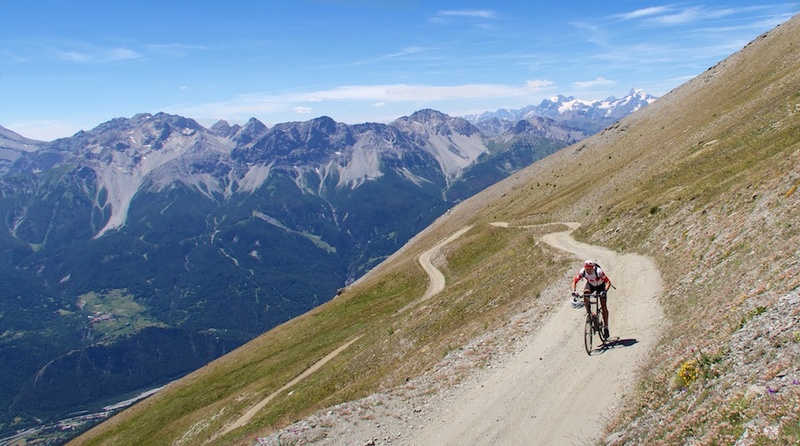 It becomes less steep above 2100 metres straightening out along a ridge, passing Forte Foëns. Before the road turn into the mountains, towards Col Basset, it intersects with another branch of the military road that climbs from Salbertrand. This is closed, or at least not passable, due to the collapse of the Galleria (tunnel) Seguret. I’ve marked it on the map. I could see the road below and the entrance to the old tunnel. Apparently there was a way to hike over/around the 876 metre tunnel, but I’ve been told that it is very dangerous, and has avalanche debris. Avoid! 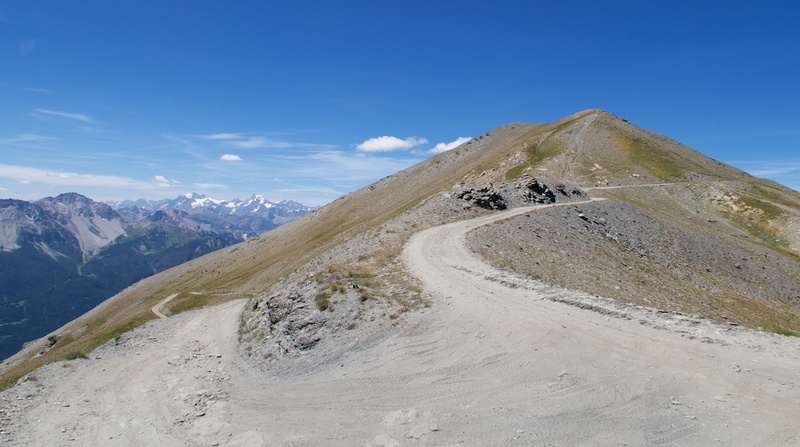 The road up to Col Basset (2596 metres) has some great hairpins. 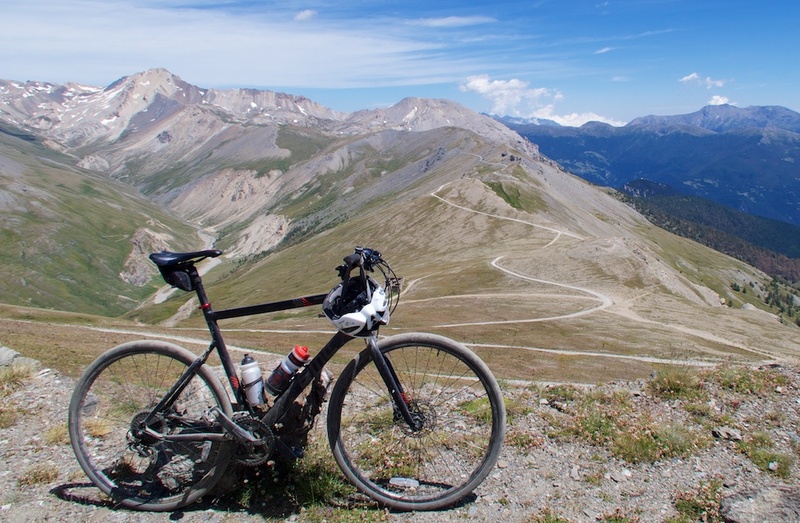 At Col Basset, the road turns left along the ridge. 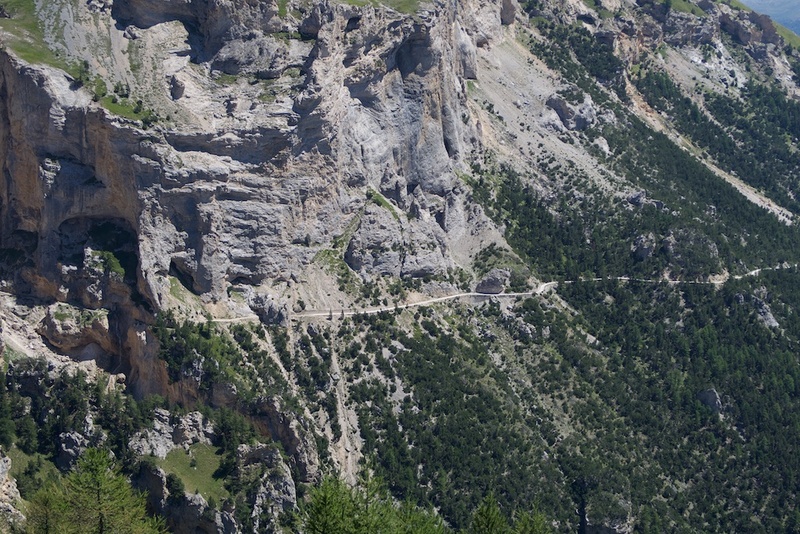 According to dangerousroad.org this is the 18th highest road (paved or unpaved) in Europe. 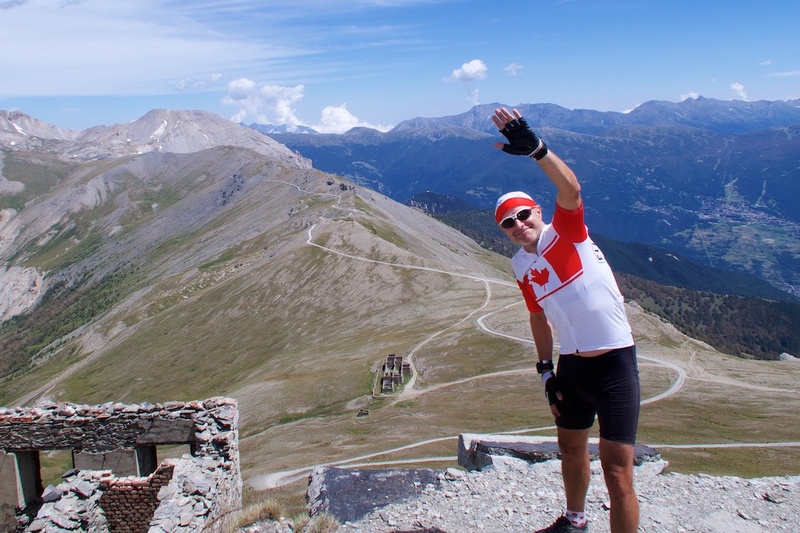 It’s a really fun road, snaking past Colle Jafferau and then heading up to the Fort at the summit of Monte Jafferau (2805 metres). Here is an alternate, also great route up to Jafferau. From Monte Jafferau, I decided to descend the ski slopes back to Jafferau. It’s a very steep, rocky road for a good 5 kms. I don’t think even the strongest cyclsist could cycle up much of this. I had the wrong bike – no front suspension – so descended gingerly and even walked a few stretches. But no big deal. This is a dream loop. So quiet, scenic …. and high. But bring a mountain bike. 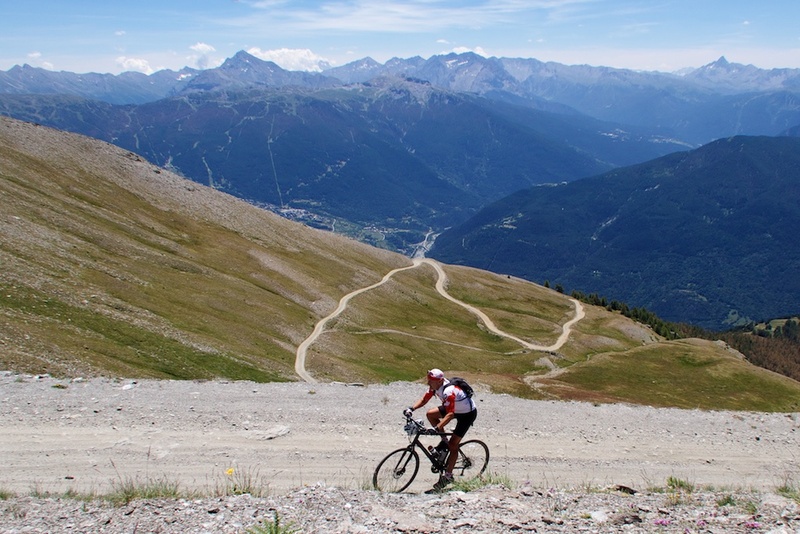 An ever higher climb, Colle del Sommeiller, also starts from Bardonecchia – reaching 3000 metres. See here. Do you know if there is a chance that the tunnel be reopened in the future? I planned to climb from Salbertrand….what about the slope above Bardonecchia ? more than 10%? As I understand it, the tunnel is seriously compromised and may never be repaired. The local government has undertaken to keep the road I climbed in good repair as compensation and as a way to keep the road to Col Basset / Fort Jafferau open. If you look at the map, there seems to be another way up from Savoulx. As the map shows, I descended it briefly to have a look … very steep. The route I climbed is rarely above 10%. The early hairpins (the “heading higher” photo) of the unpaved stretch were the steepest. But it is all very ride-able. The paved road to Jafferau is quite steep, but I don’t think over 10% often. I haven’t seen a profile but a lot of 8% – 10% I’d guess. Only my descent from Fort Jafferau is not very ride-able. In September 2018 they were repairing the tunnel. We managed to ride through, although there were 2 machines blocking the inside of the tunnel. Two people were working, to get the debris out of the tunnel. The wall in the tunnel had already been reinforced. En Septembre 2018 il y avait 2 ouvriers qui réparaient le tunnel. On a su passer, malgré qu’il y avait un petit camion et une excavatrice qui bloquaient tout le passage. Les murs du tunnel avaient également été renforcés par des fers de béton.